I went into this book not really knowing what to expect — I’m not sure how it ended up on my family’s shelves, but I noticed it one day and added it to my to-read list for the future. Now, I have no idea where my copy of this book is, but luckily, the library had a copy. 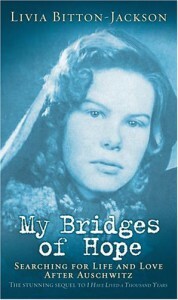 This is a memoir about a teenage girl’s coming of age after she survives the Holocaust and struggles to make a life for herself and make sense of the world after what she suffered, and after the turmoil that her country is put in post-World War II. It’s written in a very easy-to-read manner, so I can see this being a great introduction to older children and middle-graders as to what different people had to deal with during this time. It’s also a pretty quick read and told in short segments, so it would be easy to include in a Holocaust curriculum, at least in part. This is apparently book 2 in a series, and I love that it follows the aftermath of the Holocaust, which I don’t think is talked about quite as much — or at least, my teachers never focused on it as much as the Holocaust itself. I’ve never read much about what happened to Slovakia after the war, so I enjoyed this book for giving me that perspective and teaching me more about all the different countries and people who were affected by the Holocaust, and how the surrender of Germany didn’t lead to immediately fixing anti-Semitism. Livia tells her story with painstaking honesty, and it hurt to see how roughly Jewish people were treated even after the war, and how hard it was for them to reunite with family members who had already emigrated to the United States or other countries. For some, it was even impossible. Overall, I recommend this for someone who’s looking to learn more about this time period and what people had to deal with. In a way, it was heartening to read, because the community came together for each other and all supported one other so that they could make a better life for themselves. It’s still horrifying that any people were ever treated the way Jewish people were treated during this time, but reading about someone overcoming that hate and being an integral part in building up her community was heartwarming.